The Data Lab takes the Pepsi Challenge! I would posit that the world's most used data science software is the ubiquitous Microsoft Excel. Released for Windows in November 1987, this month marks its 30th anniversary. In that time I'd imagine it has been employed by all manner of people across near all industries: from the fund manager tracking his multi-million dollar portfolios to the young couple managing their family budget. There's a reason why Excel has proved to be so popular: it's actually very good! Sometimes I sense an element of snobbishness from data professionals when it comes to Excel. I get the distinct feeling that some look down their nose at it, as if it ought to be left behind in the accelerating race between competing analytical tools. However, for a lot of users this software contains all the functionality they will ever require, with its spreadsheet format making life particularly simple to inspect data sets and perform manipulations. Now before Bill Gates sends me an honourary membership of the Excel Fan Club there are clearly situations where it falls short. One of these for me is in its graphics capabilities: often is the time I have accessed a research paper only to see Excel graphs included, and my expectations of the work contained within is immediately diminshed (see, I can be snobbish too!). I am told that Excel does not scale well within large organisations, although I admit to never being in a position to either support or challenge this. A third, and potentially very serious downside of Excel is its speed of execution. It was this drawback that eventually made me look for analytical alternatives some years ago, and led me to Python and in particular its pandas package. Now Excel has many useful features and I can't possibly hope within one blog post to show how easy it is to recreate all of them in pandas. Instead I have selected some common operations so as to give encouragement to people or organisations thinking of moving away from Excel that Python pandas will not leave them wanting. To gather some data The Data Lab recently recreated the Pepsi Challenge. The original Challenge was a hugely successful marketing campaign started by Pepsi in the 1970s, in which they presented Joe Public with two cups - one containing Pepsi Cola and the other Coca Cola - in a blind taste test and asked them which they preferred. 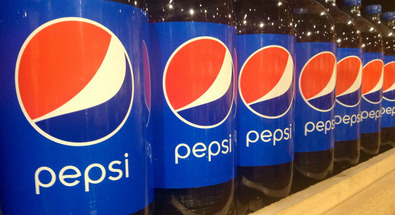 Pepsi then claimed that over 50% of subjects chose their cola based on taste alone. How confident are you that the one you have chosen is actually Pepsi? Which drink do you actually prefer? and I also tracked which drink was tasted first by each subject. With this in memory we now focus on some of the functions that are available within pandas to allow us to understand and manipulate the data, much as we might with Excel. from which we could see that "A" and "B" are the sole responses. and there are also options to determine how pandas should deal with missing values (i.e. include or ignore), a problem we do not face here. Suppose we wished to know exactly how many males and females took our Challenge. Then the value_counts function applied to the Gender column tells us directly. As ever there is increased functionality available, such as returning sorted counts or having them normalised into percentage values. 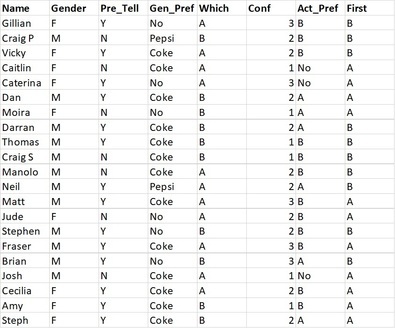 This is potentially a large topic covering lots of available options, but here I just want to show how simple it is to create a new column in our dataset showing whether the subject correctly guessed that the Pepsi was drink A. One feature of Excel that I relied upon a lot in the past was the pivot table. This allows a tabular data set to be "re-shaped" to have different row and column indices, plus have functions applied across the resulting cells. although again it is worth pointing out that there is much more functionality to be had than in this simple example. Note that all the code blocks above can be found here. This has been a whistle-stop tour of some of the functionality available in pandas that is commonly employed by business analysts in Excel. Whilst I have only scratched the surface what I hope to have shown is that Python pandas can easily accomplish the most-used functionality, often in single lines of code. Although we haven't concerned ourselves here with timing operations it should also be noted that these are performed far quicker than in Excel, particularly when acting on much larger data sets than our toy example. To give a balanced comparison between Excel and pandas I will admit that the one great benefit to a spreadsheet is the visibility of data. Often in pandas one has to keep using data.head() to ensure that functions and manipulations have performed as expected. Still, when considering all the pros and cons I firmly believe that Python pandas comes out a winner over Excel hands down. You can also find The Data Team @ The Data Lab on Twitter and GitHub. Get in touch by Email.